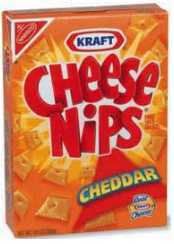 Walmart: Cheese Nips As Low as $0.50 Each! Walmart has the small 7 oz. boxes of Cheese Nips on rollback for just $1 right now. These are located on an end cap or in the center aisle in most of the Walmart stores that I have been in recently. There is a $1 off any 2 Nabisco Crackers coupon that makes these only $0.50 a box! If you can’t find the smaller boxes the 12 oz. boxes are just $1.28 which makes them only $0.78 after the coupon! Previous Post: « Acapulco Mexican Restaurant: FREE Entree on Your Birthday! I just got back from Walmart and couldnt find these anywhere. Maybe they arent available in Los Angeles? Today I was at my local Walmart in Oregon and I was had 3 coupons for crest toothpaste for $1 off 1 toothpaste. I had 3 packages of crest toothpaste and 3 coupons. The cashier told me that they changed the policy to 1 coupon per transaction and that I could not use the 3 coupons for the items I had in 1 transaction. I had to do 3 seperate thansactions and purchase each toothpaste seperate to be able to use my coupons. Has anyone else had this happen? Well I called the home office and the manager from my local Walmart called me back today. She stated that the coupon policy has been changing weekly so it is hard for everyone to stay updated. She stated that if the coupon says 1 like coupon per transaction then they have to do seperate transactions if I have multiple like items. If the coupon says 1 coupon per item then I can use multiple like coupons in the same transaction. So with the coupons I was trying to use I could of used in the same transaction. She said she is trying to inform all the cashiers of the policy but with it changing every week it is hard to stay updated.